If you’ve never visited the Hershey Public Library, 701 Cocoa Avenue, you should go. It’s amazing! 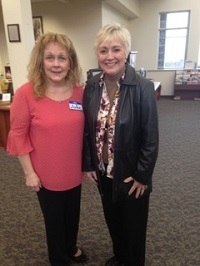 Julie Brnik (pictured with me above), Adult Programming Librarian, organized their second Local Author Festival on April 28. The purpose was to highlight the intellectual and creative accomplishments of writers while nurturing the pursuit of the writing arts. Over 30 authors participated, visiting with library patrons and answering their questions while enjoying the camaraderie of fellow authors. Each gave brief individual presentations to visitors. Even the beautiful weather contributed to the delightful Festival. Libraries are perfect places for readers to feed their habit in a peaceful environment. 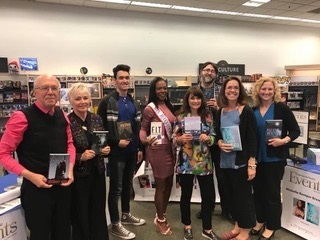 Many thanks to everyone who took time from our first gorgeous weekend in ages to visit me and my fellow writers at Barnes & Noble’s Local Author Event on April 28 and 29 in Wyomissing. B & N managers and staff are such gracious hosts. Pictured L to R are John Kissinger, Nancy, Dan Dismuke, Adrean Turner Mrs. Berks County PA 2018, Heather Christie, Todd Keisling, Michelle Kemper-Brownlow and Kristen L. Jackson who snapped our photo. And yes, their books are available at B & N and through their publishers. Fiercely independent bookstores are a readers best friend and the backbone of many thriving communities. 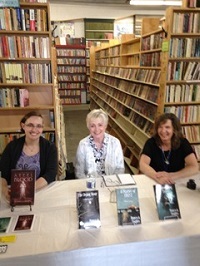 On May 5, the 20+ year owners of The Cupboard Maker Books in Enola, PA, hosted a Local Authors Event and book signing. Imagine, being surrounded by 125,000 volumes of new and gently read hardbacks and paperbacks in a plethora of genres! Pictured to my right (your left) are novelists J. L. “Hanna” Grubble and on my left, Yvonne Schuchart. Behind us are but a few of the dozens of original bookshelves from which the business derived its name. The bookstore is located at 157 North Enola Road (routes 11/15) near Harrisburg. 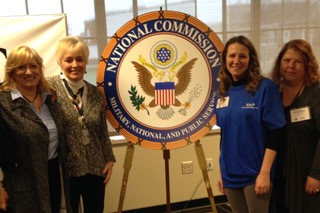 The National Commission on Military, National, and Public Service met with volunteers at Harrisburg Area Community College (HACC) in their national fact-finding tour to understand why people serve…and recommend ways to increase the number of Americans in the military, national, and public service. RSVP participants with Nancy include (left) Margie Groy and (right) Becky Gibbons and Cathy Gable. 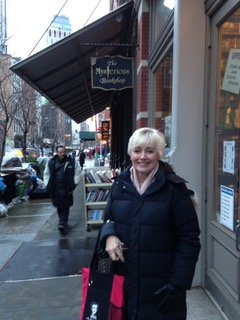 Whenever I’m in New York for a Mystery Writers meeting, I cannot resist shopping at The Mysterious Bookshop. Imagine! Over 1300 mystery authors’ works in one store. (no, that’s not a typo) How does one chose? So many mysteries; so little time. Be sure to check out their website and subscribe to their newsletter.